#Giveaway #RC #Free $25 Build-A-Bear Workshop Gift Card CLOSED! I think one thing that can always warm my heart is a smile from my kids. I find their smiles to be quite contagious, and when they smile I can not help but smile right along with them. Estrella has one of those smiles and she is a little girl who smiles quite often, even at times when she is already in a good mood, I love to make that mood even better! There are certain things that she really likes and two things that she really likes are My Little Pony and Build-A-Bear Workshop. Estrella loves watching My Little Pony and she loves collecting the different toys that come out. She also loves Build-A-Bear Workshop and how she can go to one of the stores herself or go online and build new friends for her to add to her collection of Build-A-Bear Workshop friends! 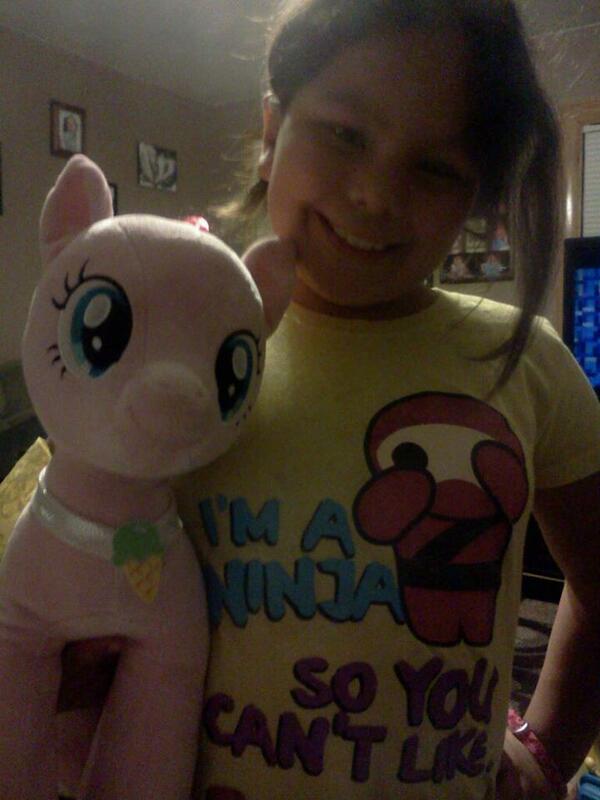 So when we were sent the adorable and very huggable Loveable Pinkie Pie to review, Estrella’s smile shone very bright! She was so excited to see the Loveable Pinkie Pie when she arrived. Estrella loved how she is so soft and snugly, and she also loves the beautiful yellow royal wedding cape that she is wearing. I personally really like the hair on this My Little Pony doll, and I love how when she arrived and Estrella took her out of the package, how Estrella lit up when she saw her! Well for the first time ever, you can head on over to Build-A-Bear Workshop and get Pinkie Pie as well as Royal Rainbow Dash along with some of their accessories and clothes!! You can also go there and pick up some of the bears that they have and some clothes for the bears that have the My Little Pony characters on them! Well to help celebrate the new line of My Little Pony products over at Build-A-Bear, the wonderful people from Build-A-Bear Workshop would like to give one of my amazing readers a $25 gift card to Build-A-Bear Workshop!!! Previous Post #Giveaway #RC #Free Ray-Ban Sunglasses from SimplyEyeglasses.com CLOSED!! Next Post Making The Holidays That Much Better With Holiday Inspired Costumes From BuyCostumes.com!! What do I look for in a body wash?ok…a fun package and nice scent is usually what I notice first! I also entered the Hobbit dvd giveaway! I entered for the Gossip Girl Swimsuit. I commented on the Willow 25th Anniversary post. I like great scents and suds. I look for a great scent and moisture! I like body wash has fresh clean scent and keep my skin moisturized. I entered the kohls giveaway. The 14 in. Sweet Velvet Teddy is super cute. love the 12 in. Girl Scouts Thin Mints® Bear! we like the Christmas limited editions like frosty and Rudolph. I have over 10 build a bears, most recent is the multicolored rainbow bear. I also entered the hobbit and rise if the guardian dvd contests. My daughter would like the 16 in. Cream Puff Kitty. I love the Embroidered 14 in. Pink Sweet Velvet Teddy. I entered the barbie giveaway! I like the chocolate lab. I like so many critters it's difficult to choose just one!Thanks! the hello kitty bear for sure! I like the 18" Sunshine Hello Kitty! I commented on the #MommyParties #XtremeCustomzParty Ridemakerz Batman Party!! post. I love the teddy bears. I also like the 14 in. Cute Caramel PupThank you! i like the 15 in. red fox! My daughter really wants their roller skates for her Build a Bear rudolph! the 5 in. Angry Birds Grandpa Pig in really cute and fun. I love the Hello Kitty! I like the Cheerful Sunshine Hello Kitty®thank you for the chance to win! I commented on Lands End. I like the Calico Kitty. The ponies are so cute!!! We also really love the Cheerful Sunshine Hello Kitty. I commented on the The New Strider SUPER 16 Balance Bike post. I love their Casually Cute Girl Scouts Thin Mints® Bear! I also entered your Dial body wash giveaway! i like the cat ones! https://www.mommykatie.com/2013/04/nsnation-spon-nutrisystem-week-4-stay.htmlI entered:Purex and Build a BearButton is at harvestlanecottage.com at bottom of pg. I really like the Paddington Bear! The ponies are my favorite, but I also like Sunshine Hello Kitty!